Micrococcal Nuclease (MNase) is suitable for removing nucleic acids from cell lysates, releasing chromatin-bound proteins and shearing chromatin for use in chromatin immunoprecipitation (ChIP) experiments. The enzyme activity is strictly dependent on Ca2+ and the pH optimum varies according to Ca2+ concentration. The enzyme is therefore easily inactivated by EGTA or EDTA. Purified Micrococcal Nuclease is formulated in a storage buffer containing 20mM Tris-Cl pH 8.0, 50mM NaCl, 1mM DTT and 50% glycerol. One unit will produce 1.0 μmole of acid soluble polynucleotides from native DNA per min at pH 8 at 37 °C, based on EM/260 = 10,000 for the mixed nucleotides. 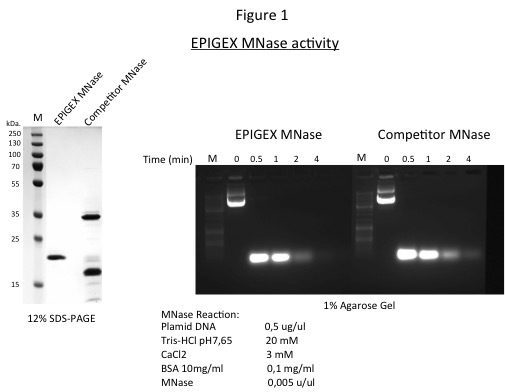 Purified recombinant micrococcal nuclease is evaluated by 12% SDS PAGE mini-gel for protein purity and by spectrometry and 1% agarose gel for nuclease activity (Figure 1, right and left panels). 1. Van Holde, K. E. (1989) Chromatin, 1-497. 2. Luger et al., (1997) Nature, 389(6648):251-60..